A driver in a stolen vehicle lost control, drove through a fence and hit a parked car at a St. Pete home Monday night. 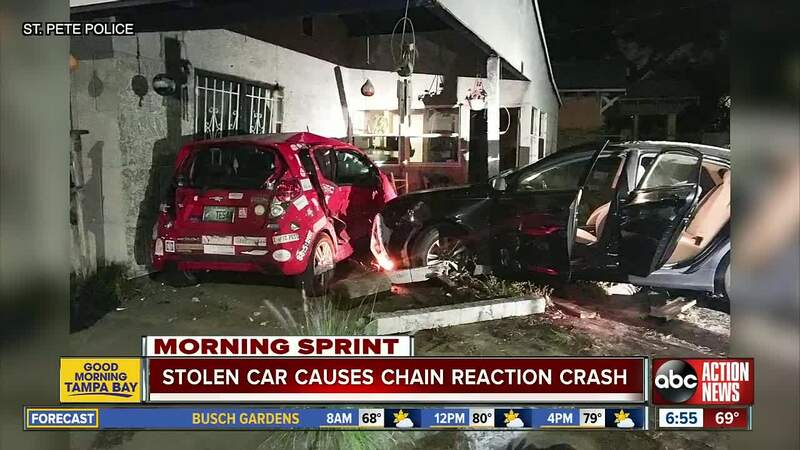 ST. PETERSBURG, Fla. — A driver in a stolen vehicle lost control, drove through a fence and hit a parked car at a St. Pete home Monday night. It happened on 19th Ave. S shortly after 10 p.m. The driver of the stolen Hyundai drove through a fence and hit a parked car in front of the house. The impact pushed that car into the wall of the home. Only one person was home and he was not injured. The unknown driver ran from the scene and hasn't been found. The fire department checked the house and determined it was structurally sound, so the resident will not be displaced.